Make Music Day, the annual global celebration of music on the summer solstice, returns this year on Thursday, June 21 with more than 4,500 free outdoor concerts, music lessons, jam sessions and other exciting music-making events being held in over 70 U.S. cities in 31 states. Austin, Boston, Chicago, Cincinnati, Cleveland, Hartford, Los Angeles, New York City, Madison, Miami, Minneapolis-St. Paul, Philadelphia, Salem (OR) and Nashville are among the numerous cities hosting major celebrations – as well as the entire states of Vermont and Connecticut – in what has become a worldwide phenomenon observed by hundreds of millions of people in 800 cities in 120 countries. Additionally, iconic buildings and landmarks in participating U.S. cities will turn orange to mark the all-day musical free-for-all, which brings together musicians of all ages, backgrounds and genres, amateur and professional alike, to make and enjoy music. Completely different from a typical music festival, Make Music Day celebrates and promotes the natural music maker in all of us, regardless of ability. Reimagining their cities and towns as stages, every kind of musician – from bucket drummers and opera singers to hip-hop artists and marching bands – pours onto streets, parks, plazas, porches, rooftops, gardens and other public spaces to celebrate, create and share their music with friends, neighbors and strangers. Highlights of Make Music Day in the U.S. will include Street Studios in over 10 cities – including New York, Boston, Chattanooga, Minneapolis-St. Paul, Nashville, Philadelphia Portland (ME) and in a Reedsburg (WI) cow pasture – where DJs and producers bring their gear and engage passersby and musicians in the spontaneous, collaborative production of original music; Sousapaloozas in Chicago, Fullerton, Hartford, Minneapolis-St.Paul and Salem (OR) that bring together hundreds of brass and wind musicians to play the music of John Philip Sousa; and over 200 Mass Appeals that gather large groups of musicians to participate in impromptu performances using single instruments such as guitars, harmonicas, accordions, flutes, percussion, trombones, French horns, synthesizers, ukuleles, djembes and saxophones. From Nothing to Something: A BNA Spoon Jam – At the Nashville International Airport, travelers will be invited to participate in a mass spoon play-along event led by Lucious “Spoon Man” Talley and in partnership with the National Museum of African American Music, and Arts at the Airport. Travelers will be given a pair of spoons to keep. Harlem to Broadway! – At the Richard Rodgers Amphitheater in Harlem’s Marcus Garvey Park, a concert celebrating music from the “Great White Way” will be held featuring selections from the songbooks of legendary composers and Harlem residents. The concert is presented in partnership with Jazzmobile and the Marcus Garvey Park Alliance. Musical Intervention – Record Attempt at Most Vocal Solos in a Recording – In New Haven, people will try to break a record for most vocal solos in a song recording. Organizers are inviting at least 500 people to have their voices recorded. World’s Largest “M” – On the site of the largest “M” in the world, built out of limestone on a hillside in Platteville(WI), participants will play a variety of percussion instruments on each of the 266 steps leading to the top. Young Composers Contest – In celebration of Make Music Day, music technology company MakeMusic and the American Composers Forum are hosting a composition contest for young composers aged 13-21. Judges will select one piece for wind band to be performed live in select cities on Make Music Day. Global Make Music Day highlights include over 500 events in the U.K. with featured projects for song-making, brass bands and rural music-making, 3,000 events in more than 100 cities in China with an opening ceremony at the China Millennium Monument in Beijing, Australia’s first nationwide celebration, and 200-plus events in the Nigerian cities of Lagos, Abuja and Kaduna. 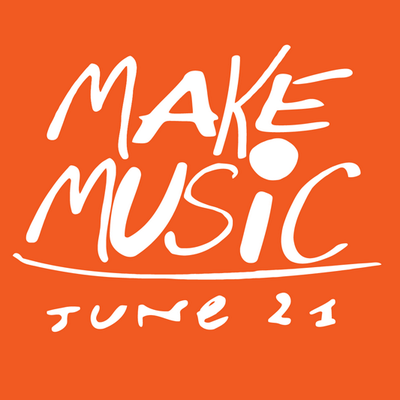 Also, famous buildings and landmarks in participating cities worldwide will join their U.S. counterparts in shining orange in honor of Make Music Day.